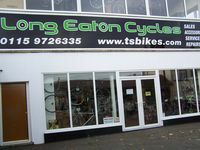 Long Eaton Cycles is a family business that began trading in the summer of 2002, making us Long Eaton's oldest cycle shop with the same owners, in which time we have become one of Nottingham's premier stores. We have spent a long time building up the brands we stock and our relationship with the distributors of those brands. The Brands we stock are. In 2013 we moved to our current location at 20 Tamworth Road. We introduced several new brands at that time including KASK helmets. 2016 saw us expand our store by opening part of our space upstairs into a newshowroom, this has allowed us to commit to more great brands and products. In 2016 we became one of the sponsors of the very successful Godfrey Bike Wear team,(now the Bryan Steel Academy) supplying them with Bianchi Bikes, Mavic wheel and shoes and Kask Mojito helmets, have a look at the team launch video on the home page, in 2017 we have continued this venture and are supplying Giant TCR Advanced bikes the New Mavic Carbon Cosmic wheels and Kask Mojito helmets again, 2018 Bianchi came back on board as the bike supplier and the guys rode the beautiful Bianchi Aria, the bike was loved so much by the riders that in 2019 they will great a brand new version, we hope that they have another great year. Our family owned business is run by cyclists and caters for all types of riders. We offer an outstanding repair/maintenance service, second to none, with quick turn around times and competitive pricing.